WINONA, Minn. — Jazz at Saint Mary’s and the H3O Jazz Trio will join forces during Saint Mary’s University of Minnesota’s twice-yearly “Jazz Final” on Sunday, Dec. 16, from 6:30 to 9:30 p.m. during Island City Brewing Company’s monthly Jazz Jam. Saint Mary’s two jazz combos and the entire big band will kick off the first hour with a recap of their favorite selections from the fall semester. H3O Jazz Trio will lead for the rest of the evening. Now in its fourth month, the Jazz Jam at Island City Brewing Company, 65 E. Front St. in Winona, is an open mic night for jazz. Whether you play an instrument or sing, the Jazz Jam is your chance to sit in with a professional rhythm section. Everyone is welcome and encouraged to perform some of their favorite jazz standards. Interested jammers can choose from a wide selection of jazz tunes. Performers can choose music from Hal Leonard Real Books, bring their own, or ask the trio if they can play their favorite. It’s as simple as signing up on a clipboard. Island City Jazz Jams are the third Sunday of each month from 6:30 to 9:30 p.m. in the tap room. The event is free and open to all ages. If you’re not quite ready to sit in, you are welcome to come and enjoy a great evening of jazz. For more information about this event, please contact Ashley Haig, Island City events coordinator, at 507-961-9743 or events@islandcitybrew.com. The father and son’s jazz trio H3O began performing together when bassist Max Heukeshoven was only 14 years old. Along with older brother Hans on drums and vibes and dad Eric on the piano, the group was asked to play for a private pool party and haven’t stopped since! A. Eric Heukeshoven is an assistant professor of music and director of Jazz Studies at Saint Mary’s University of Minnesota. Hans Heukeshoven is a 2015 graduate of Saint Mary’s. Max Heukeshoven is completing a degree in Music Industry at Saint Mary’s. H3O Jazz Trio performs a wide variety of jazz styles including original music. They have worked as the rhythm section for numerous area professionals including Minnesota Music Hall of Fame’s Les Fields and Dr. John Paulson. Recent appearances include Midwest Music Fest, Great River Shakespeare Festival, Free Family Concert Series, and many other venues. 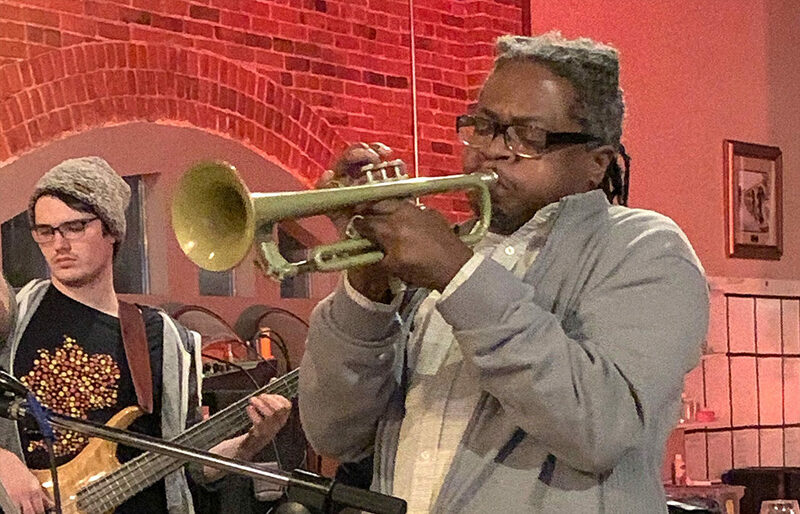 The trio hosts a monthly Jazz Jam at Island City Brewing Company in Winona on the third Sunday of every month from 6:30 to 9:30 p.m.
Photo caption: Jamal Mayfield of La Crosse, Wis., amazes the crowd with his trumpet.